Hitchcock (2012) came and went with nary a peep last year, and I'd be lying if I said I couldn't see why. It's a Hollywood style biopic, with all the attendant strengths and weaknesses that entails. The biopic has fallen from favor in recent years, and I attribute that in large part to the merciless skewering the form received at the hands of the underappreciated - yet widely seen - Walk Hard: The Dewey Cox Story (2007). Even casual viewers have grown wise to the narrative beats of the Hollywood biopic and recognize the associated tropes and cliches. Granted, Hitch never sank to the same melodramatic extremes found in the lives of many biopic subjects, but Hitchcock does suffer from an overriding sense of familiarity. 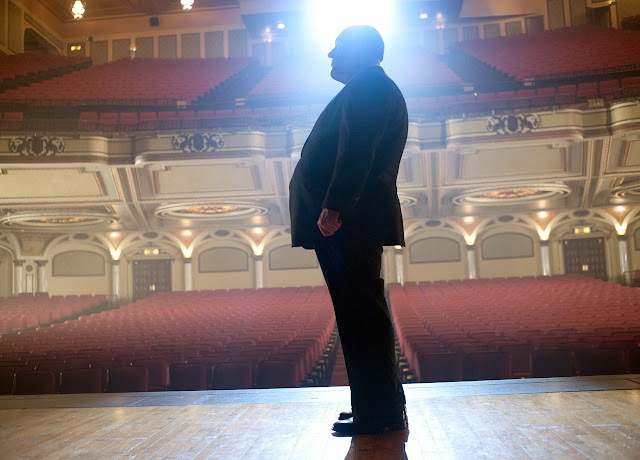 Hitchcock isn't a traditional biopic, though, insofar as it doesn't attempt to address the entirety of Hitch's career. The movie concerns itself with the time period beginning and ending with the production of Psycho (1960), a watershed event in both Hitch's filmography as well as the history of cinema itself. Hitchcock further skews from form in the sense that the narrative, ostensibly about Hitch himself, is in fact predominately about his wife Alma Reville. Nothing wrong with that, mind you, particularly when Alma is portrayed by the always incredible Helen Mirren. There's loads of entertainment value to be had just from watching old pros Anthony Hopkins and Helen Mirren doing what they do so well. Still, it's not hard to see how a viewer could be disappointed by the overall experience Hitchcock provides. The narrative never delves very deeply into just what exactly made Hitchcock tick, and that's a glaring deficiency. Hitch was larger than life, a droll and morbid misogynist with a pitch black sense of humor, and though Hopkins delivers a typically solid performance, the script fails him. Hitch's creative process here is portrayed largely by way of a rather awkward narrative conceit in which he shares on ongoing internal dialog with Ed Gein, the infamous real-life nutjob upon whom Robert Bloch's novel Psycho was based. It's a reach, and it never really succeeds in illuminating Hitch's creative process. It's a conceit that reeks of Screenwriting 101 and never manages to feel organic or germane. Perhaps more damning, however, are inaccurate details about the filming of Psycho that even a casual fan of Hitch's work will be likely to notice. For example, composer Bernard Herrmann's iconic string accompaniment to Psycho's shower scene is treated as an afterthought. While it's true that Hitch initially wanted no musical accompaniment for the scene, it's egregiously dismissive for the movie to treat its ultimate inclusion as though it was just hasty, ill-considered happenstance. 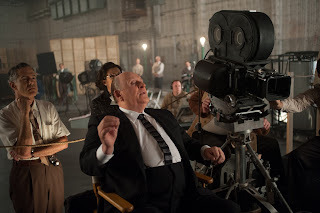 Hitchcock also presents the meticulous creation of the shower scene, which took a week of set-ups and filming, as though it occurred in a single frenzied outburst performed by Hitch himself. Perhaps that serves the dramatization of this film's narrative, but you're begging criticism when you play fast and loose with the details of one of the most thoroughly documented and scrutinized scene shoots in the history of the medium. Still, though, I'd also be lying if I said I didn't enjoy Hitchcock. Performances are strong throughout, particularly a brief and sublimely perfect perf by James D'Arcy as Anthony Perkins. Ralph (The Karate Kid) Macchio contributes a fun cameo as screenwriter Joseph Stefano, as well. Hopkins has fun delivering some suitably Hitchcockian bon mots like the one in this article's title, and Hitchcock is loaded with moments that likely aren't accurate, but feel like they ought to be. I laughed aloud at the scene in which Hitch and his agent are brokering their deal for Psycho with Paramount head Barney Balaban and Hitch pulls out his checkbook to bankroll the project himself. Sure, it's patented Hollywood myth-building hokum, but it's entertaining hokum. Hitchcock is recommended, but temper your expectations. I've been curious about this one, and after your review I think I'll still keep it aside for a really rainy, really boring day.